Tuesday Bunch waits to help YOU. Left to right: Mary, Dolly, Susan, Juanita and Pat. 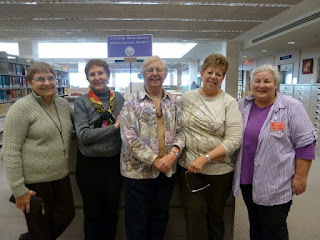 These are the helper-volunteers from the Eastern Washington Genealogical Society who are there in the downtown Spokane Public Library every Tuesday just waiting to help YOU with your family history projects and problems. They are there from 10:15 (when the Library opens) until late afternoon with an hour or so off for lunch. Parking is in Riverpark, under the Library, west-down the Main Street hill (past the Spokane Club) or even north across the Monroe Street Bridge...... or you can certainly take the bus downtown and walk the block to the Library. Did you realize that the Douglas Fir, that we all admire, was named for an early explorer who tromped around the Pacific Northwest from 1825-1833? Our MAC museum (Museum of Arts & Culture) currently has an exhibit all about Douglas and his time in the area. If you're at all interested in the history of the area, this would be a delightful visit. The MAC is open Wed-Sat, 10-5, and is located at 2316 W. First in Browne's Addition. My parents came to the area in 1954 but I know many whose ancestors came barely 20-30 years after David Douglas had been here. I recommend this as a Thing To Do. The tree named for David Douglas was greatly admired by the collector for its great size, its variable habitats, and its potential as a timber resource. The condor, a “beautiful buzzard of the Columbia”, fascinated David Douglas. Unique specimens of a recently preserved California condor and an albatross with a 9-foot wingspan will be included in this exhibit. Naturalist David Douglas traveled the Columbia River and interior Northwest (1825-1833), identifying and collecting over two hundred species of plants, animals, and birds previously unknown to science. Learn of his interactions with native tribes and fur traders of the Columbia country. Explore a unique scientific legacy, including his namesake, the Douglas fir. Enjoy a multi-disciplinary experience that links geography, science, art, and cultural history. Names have always fascinated me....... and really unusual names always catch my eye. Like Zackquill Morgan............ Capt. Zackquill Morgan, Jr., was born 1 Aug 1782, the son of Col. Zachquill Morgan, Sr., near Bladenburg, Monongahela, Virginia and died in the War of 1812, 24 Aug 1814, during the retreat from Washington, DC. He was a drummaster. On 28 Apr 1805 he had married Elizabeth Madera. I Googled his name to find this information. Like Ambazilla...... ages ago I was looking at the Coroners' Records in our Spokane County Courthouse and caught this lady's name. Doing a search of the Washington death records (on www.digitalarchives.wa.gov ) the only Ambazilla I found was Mrs. Spencer Owen, a real estate agent here in Spokane in the 1900 census. Doing the math, she was born in 1861 in Iowa and married in 1880. They had five children, all born in Nebraska; such an interesting start to a family history. Bet you're like me and unusual names catch your attention too. Care to share any of your special ones with us?? Do you have a need for your very own personal Parrott Rifle? It weighs 500 pounds, costs $1041.70 (plus shipping) and the rolling cradle is extra. Oh, and you better have a humungous truck to go fetch it. And where can you get such an item? In Post Falls, Idaho! Would you believe? Hern Iron Works "is the successors to the respected Washington Machinery Foundry and the National Iron Works, established in 1884. Hern Iron Works was constructed in the 1970s on a wholly-owned 30-acre parcel ...... " near Post Falls.This company offers a goodly line of products including different kinds of canons! You can buy a Revolutionary War Howitzer, an English Swivel Gun, a Coehorn Mortar and a Parrott Rifle (which is really a #1000 canon! ), an Ordnance Rifle, and a Carronade. Who would have thought that such a company is right in our back yard??? F.Y.I. The Parrott Rifle was developed by Robert Potter, supervisor of the West Point Foundry from 1836-1867. This canon was easy to use, cheap to make and quick to produce...... "the best practical thing that could be got at the time." It was a cast iron canon. Now who would buy such a thing? Those who re-enact historical times, that's who! 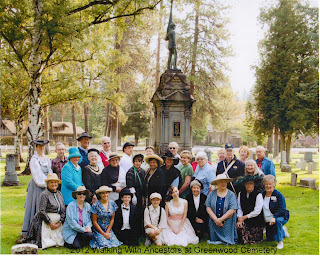 At our recent Walking with Ancestors we were admiring a vintage Civil War canon in Greenwood Cemetery and it was Charles Hansen who tipped me off that you can buy your own right here in our neighborhood. Who would have thought? 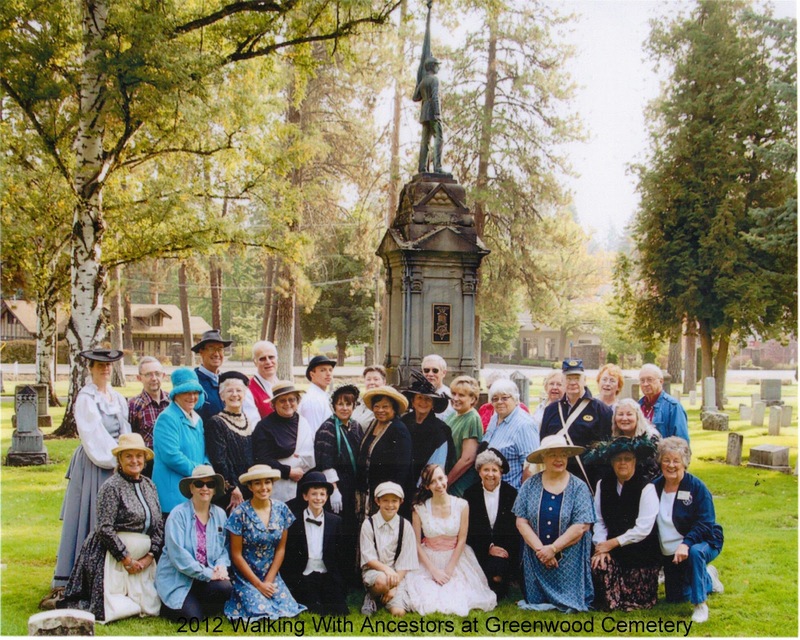 This picture was taken by Jerry Johnson at Greenwood cemetery for the Walking With Ancestors, Thanks Jerry.